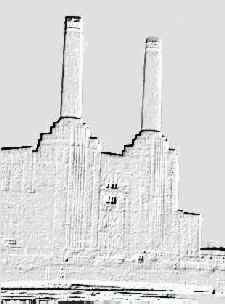 "Roger had the idea for this cover and suggested flying a large inflatable pig from the towers of Battersea Power Station. He wanted to do it for real... no photo-trickery. Although the image of a pig suspended between the stupendous chimneys on a windswept day possessed a great sense of mood, it was the pig itself which caught the headlines. The day of the shoot was fantastic with a dramatic sky like a mixture of Turner and Constable. First the pig was inflated, but this took so long that it was not actually launced all day. The entire complement of eleven photographers and thre film crews stood idle. The manager, with clever foresight, had hired a marksman with telescopic rifle to shoot down the pig if it escaped its mooring ropes and sailed off into the skies, where it would become an insuranse risk. He also stood idle. On the scond day, the manager with not quite such clever foresight had decided to ease the marksman on economic grounds. The inflated pig was launched into the air and secured by guy-ropes in between the towers. Everybody was very excited: cameras started clicking, film started rolling. But then a violent gust of wind suddenly paid to our plans. The pig lurched one way, then the other, and then tore free of its moorings. It disappeared into the heavens in a trice. But there was no marksman to shoot it down. There was no time even to get a photo. Instead, there were a lot of people on the ground looking forlornly into the empty sky. 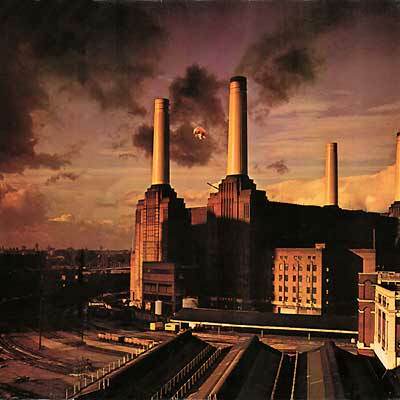 The pig ascended into the flight paths of incoming jets laning at London's Heathrow Airport. Pilots stared in horror. The pig, with a mind of its own, carried on into Kent and descended upon a rural farmer. One can imagine the disbelief of his wife when the farmer said to her "guess what..."
The redoubtable roadies rescued the pig from the farmer that night, returned it to London, mended the punctures and put the pig up again so that we could photograph it the next day. The day was cloudless, with a bright blue sky, but it was not very striking. The pig was therefore stripped into the final artwork from day three into the sky of day one, which is how it could have been done in the the first place. One could have photographed the pig at a separate venue, or even as a model. This might have saved a great deal of money, and a great deal of anxiety, but would certainly have prevented a jolly good story unfolding and a jolly good laugh being had by all, even the manager. And maybe Roger was right in that it actually did look better by being the record of a real event. from the book coming with the "Shine on" CD-box set.